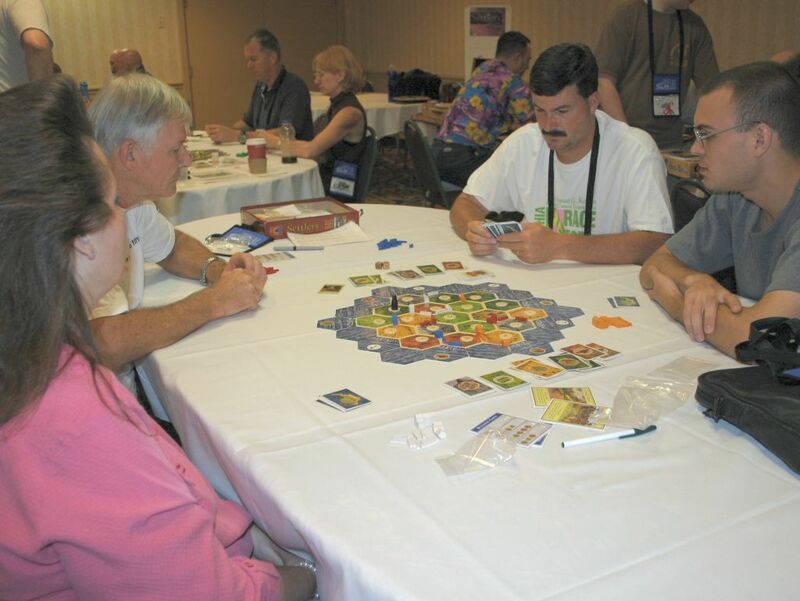 The fourth anniversary of the current Siedler von Catan format saw 100 settlers join us for the annual fest. Once again, we had quite a number of day badges arrive to specifically attend our event. Despite the new location and number of entrants, we got down to building layouts and shaking dice by 9.15 am. The ongoing format, borrowed from Kosmos, has players settling for a minimum of three games. Tournament points are earned based on placing 1st, 2nd, 3rd or 4th. The 16 highest scoring settlers advance to the semifinals. Our three-year streak of not adjudicating ended this year with a game called due to time. With 90 minutes allotted to each game, time does not appear to be an issue with nearly 400 games completed successfully. For those unable to commit the time to play three qualifying games, we continue to accept drop-ins and drop-outs. My thanks to those who notified me prior to dropping. It makes the subsequent tables much easier to sit. Normally, it is relatively easy to determine the "Sweet 16" advancers. This year, we had to resort to the third level of tie-breaking procedures. A husband and wife were among the "day trippers" this year. I'm sure it was a worthwhile trip as Mike Richey and Virginia Colin placed 5th and 6th respectively. Honorable mention goes to Rich Meyer for just missing out on the rare 6th place wood by a scant 0.07%. An additional award of "wood" was given this year. A pair of boxes from Catan Box was provided by your friendly GM staff, in case wood from plaques wasn't enough. A game box for the board game (designed to hold the basic game, Sea Farer's and Cities & Knights) was awarded to 1st place. Placing second got you a box to hold the two-player card game as well as all six expansions. See www.catanbox.com for further info on these items. In a game full of dice rolls, the Final match went a full five times around the table before the first 7 was rolled. 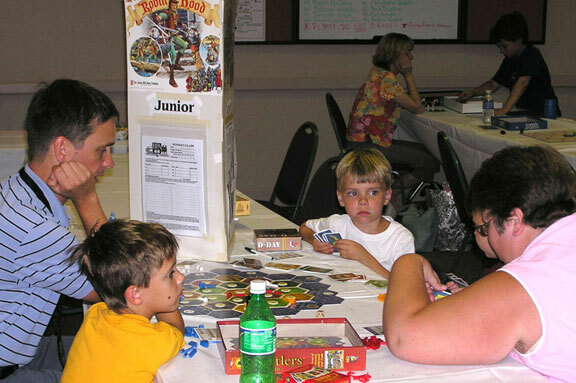 Plenty of resources and trading occurred in the critical early stages of play. Cheryl Merica was involved in very little of the initial trading as she seemed to obtain exactly what she needed from the dice. A very good strategy! Another, equally "good" strategy was Jim Fishkin relying on his "boxcars" strategy. The 12 spot paid off well for Jim. Right up until the first "7" was rolled and took away the fruits of that labor. Despite this being the Final, the game was a very friendly one. Lots of banter and laughing, mostly about who was or wasn't in the lead. Rob Effinger spent much of the game seemingly in last place, but in a powerful pair of turns jumped ahead with the largest Knight card and a hidden point card to take the game with 10 points. Congratulations to Rob for a hard fought victory and to Jim Fishkin, Jeff Bowers and Cheryl Merica for a well contested Final.